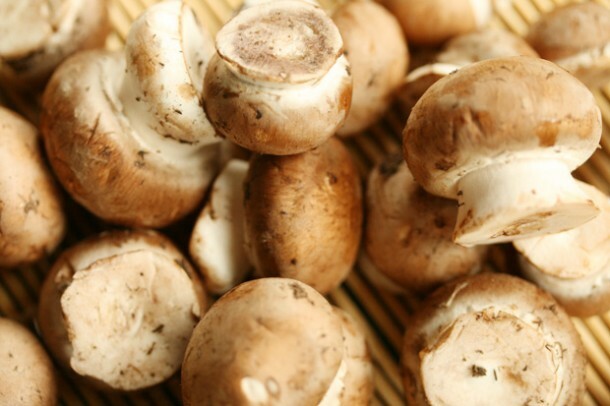 Mushrooms are a wonder food when it comes to weight loss, cancer, and cholesterol management. Trying to cut back on meat but love the savory taste? Mushrooms have the same savory amino acids found in beef and other meats, but with a fraction of the calories. In fact, “the most nutritive mushrooms rank alongside meat and milk in potential nutritive value and considerably higher than most legumes and vegetables” according to this study. At 19 calories per cup, sauteing rich tasting mushrooms is a great way to add plenty of rich, meaty flavor to almost any dish while cranking up nutrition. Baby bella or Cremini, gathered just 49 days after planting, are really immature Portabello mushrooms that haven’t come into their “gills” yet. If left longer to grow, they will open up into larger Portobella caps that are ideal for burger substitutions, stuffing with goat cheese or sausage and grilling whole, and even used as lasagna layers in place of pasta sheets. Baby bella or Cremini are both great sauteed with onions as a super savory way to top your veggie burger or turkey burger in place of high sodium sauces. Mild cremini are also the perfect way to segue “white mushroom” folks into stronger tasting varieties, like shiitake and Portobello. Savory shiitake mushrooms go way back in folk medicine over a 1000 years in Asia. They are highly prized for their medicinal properties, including their ability to boost both the immune and respiratory system. 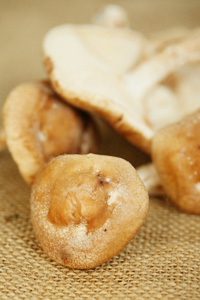 They have a meatier, denser texture compared to white button or cremini mushrooms. Shiitake mushrooms are promoted to fight the development and progression of cancer and other diseases, as well as breast cancer by boosting the body’s immune system. All mushrooms are superfoods for your heart, since they are an excellent source of niacin — a B-vitamin used in pharmaceuticals to reduced blood serum cholesterol levels and triglycerides. To enjoy shiitakes, follow the 101 guide below. One thing — the caps are where the “yum factor” lies. Discard their woody stems, which aren’t palatable and don’t soften well even when cooked. To boost the flavor of other veggies like asparagus, add them, thinly sliced, to the skillet. 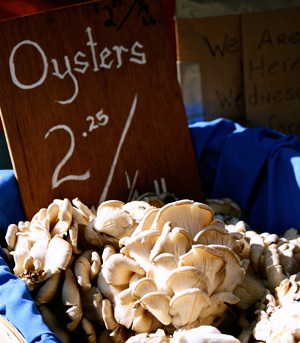 Oyster mushrooms are a gourmet varietal that are similar in texture compared to shiitake. 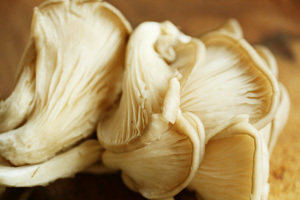 In terms of health, there are studies that eating oyster mushrooms can help to control cholesterol. The most common variety is yellow, but there are also blue oyster mushrooms that you can cultivate from a starter kit yourself. Regardless, oysters are wonderful grilled or sauteed in clusters and used as a centerpiece on your plate. Serve them over creamy spinach dip, sweet potato mash, butternut or quinoa risotto. 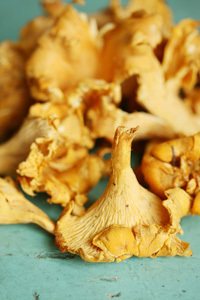 Chanterelle are wild foraged mushrooms that have an orange hue and a very tense, almost chewy texture. They are highly prized by gourmet cooks and chefs alike and tend to be quite pricey, around $20 a pound. Chanterelle mushrooms have a peppery flavor (they’re called Pfifferling in German, which comes from the German word for pepper). Chanterelles’ health profile brags a good dose of vitamin D, a rare and vital nutrient that’s quite hard to get from foods. Chanterelles and garlic are gorgeous together, and make the perfect topping or gourmet garnish for almost any dish. Simply follow the cleaning tips below. Then warm a medium skillet over medium-high heat. Add a tablespoon of light olive oil, a teaspoon of minced garlic, and minced parsley and cook about 2 minutes until soft. Look for dry, smooth caps that are free of scratches or blemishes including dark spots. Pick mushrooms aren’t broken or damp. Get the best, freshiest mushrooms should be purchased from your local grocer or a very knowledgable forager. Want to learn more about shopping for mushrooms? Visit my shopping for produce guide. The first step to cooking mushrooms is cleaning them. For mushrooms that are farm-raised (like button, cremini, Portobellos, baby bellas, and shiitake), use a damp paper or kitchen towel to brush away any dirt or debris clinging to the caps. Don’t dunk them in water or rinse under cold running water because most mushrooms have sponge-like cells that drink in water, making it hard to get a good brown sear on them if they are waterlogged. If you’ve gone wild and picked up some morels and chanterelles (only get these from a good quality source like a reputable mushrooms hunters or gourmet shop): Most wild mushrooms should be submerged in water because they typically gather more dirt and other debris from growing in the woods. Morels and Chanterelles are also not as porous as other types of mushrooms, so they tend to pick up less water. After soaking or rinsing, dry them by loosely wrapping in a paper towel. Slice them or mince them and place in a large bowl. Heat a large or medium skillet (depending how much mushrooms you have) over medium-high heat. Add one tablespoon of an oil with a high smoking point (such as light olive oil, canola, or coconut). Add a pinch of salt and cook about 2 minutes, stirring often until the mushrooms are golden brown and soft. Serve in your favorite dish, on a salad, over top of rice, or just plain with a drizzle of your favorite healthy cooking sauce. What Are Your Favorite Mushroom Recipes? Love to hear from you how you cook with mushrooms. What recipes do you make? Have any interesting tricks to add them to dishes? Please share in the comments below! Of course, I would also love it if you could share this post!